It's All Connected: Chicken Ranching on a VERY Small Scale! This roofed section over the nesting box lifts so you can gather the eggs. It's adorable! The only problem is.....it's really, really small. I was told it should hold about twelve chickens. It will hold two! Four chickens would make me the official owner of a battery farm! 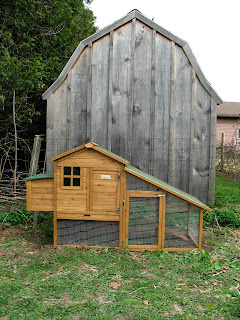 Sooo.....now I am planning an addition to the coop. Go ahead and laugh at my miniature chicken coop!!! I'm still thinking of how to add on. Aw, I think it's cute. Thanks Rosemary. I do think it's cute but it's sure not practical! I can't tell from the photos, but maybe you are thinking that each chicken needs more space than she actually does. Keep us current with the chicken story! Seriously, this coop is the size of a rabbit hutch. Two chickens will freeze to death in a Canadian winter so I have to make it bigger and get up to at least four. Yeah, I agree with having two chickens...there is no way you could have twelve in there without there being problems. It will be nice to have fresh eggs won't it? Good luck! Especially since my daughter is famous in Canada for lobbying to end battery chicken farming! It would have to go with the big whale weathervane he has on top! Maureen ... I am not laughing ... I love it. Wish I had one, but don't think I have time to tend to chickens. I thought I was saving myself the trouble of figuring out how to build one. Now, I have to figure out how to build it bigger. I think it's adorable too, but so far just a 'room for two'. They need an extension, like a run that you put on the front of a rabbit hutch ! Can you send your fella over here to add on to it? I'm really not focused enough to be using my skilsaw! my hat's off to you and your ambitions! ever read Betty MacDonald's The Egg and I? A must. Not only have I read the book, that movie and Shenandoah were our favourite family movies when I was growing up. We never missed them when they came on TV! It's just so darn cute Maureen! I love it reminds me of my Grandmother's chicken house. Do you think a tiny curtain in the little window is too much? You know I have to decorate it! Thanks! We'll see if the chickens think so when I pick them up at Easter. Thanks for visiting my blog and saying such lovely things! I'm following you back via linky. 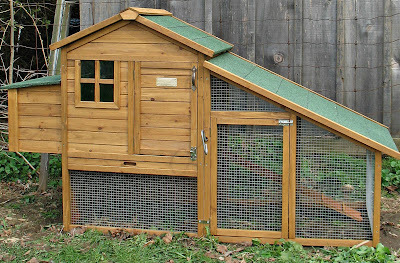 I want a chicken house and a rabbit hutch! Good luck with yours! hahahaha... okay, Im not laughing at the coop but how you wrote about it! Love me some humor. yes, That looks like it'll hold only 2. I'm so searching for a little coop for my guinea pigs. In India you dont find anything easily. love the coop though. The shed belongs to the neighbour. I'm really only complaining about it because it is one of 3 he erected that cut off my view. I was thinking of garage sales for a playhouse that I can use for an addition! Shall we do 'imaginary' lunch some day? Well you did dare me so I am giggling! 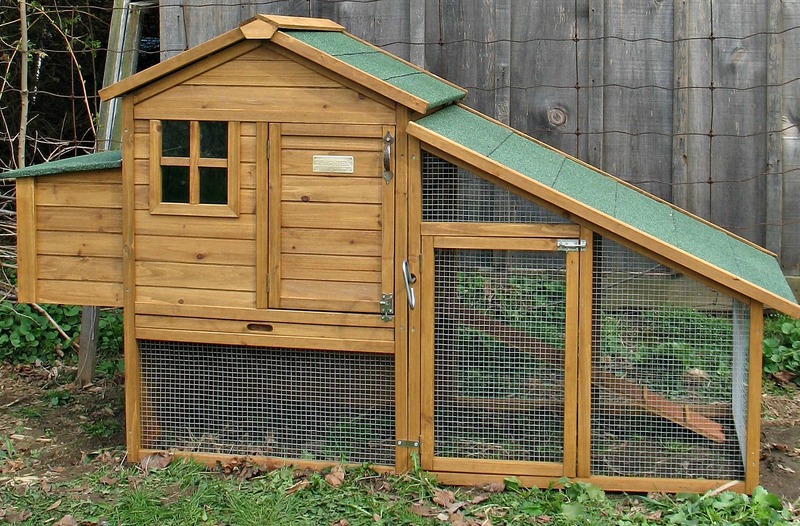 Love that you're getting chickens - they'll love their swanky new digs. I don't care that it is small. 2 chickens are perfect to start with. Well I think it's very nice looking and cute. Love to see your chickens in it. Thanks! I'll probably pick the chickens up from my daughter on Easter weekend.